If the shrimp are shelled or raw, remove all of the shell up to the tail (leaving the tail on makes them easier to eat). Devein the shrimp by running a sharp knife along the spine of the shrimp to remove the black "vein". 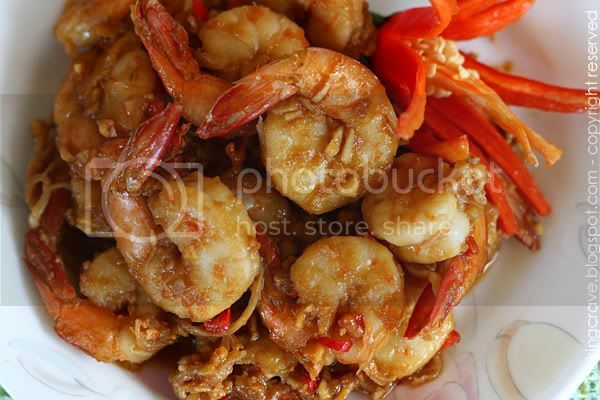 Marinade the shrimps with oyster sauce, soy sauce, fish sauce, brown sugar, minced garlic, lime juice and fresh chili (if using). Stir well to coat. Heat some oil in a wok or frying pan. When it's hot, add the shrimp (with the marinade). Stir-fry 2-3 minutes, or until shrimp are plump and turn pink (also lightly browned from the sauce). Do not overcook it, or the shrimps will turn rubbery. Garnish shrimps with lime wedges, some red chilies stripes and coriander leaves. Served warm with rice. Notes: Squeeze in more lime juice if prefer a more sourish taste and for those who loves spicy food, add in some "chili paddy" (small chilies) chunks in it. My recipe up there are suitable for kids, very mildly spicy. 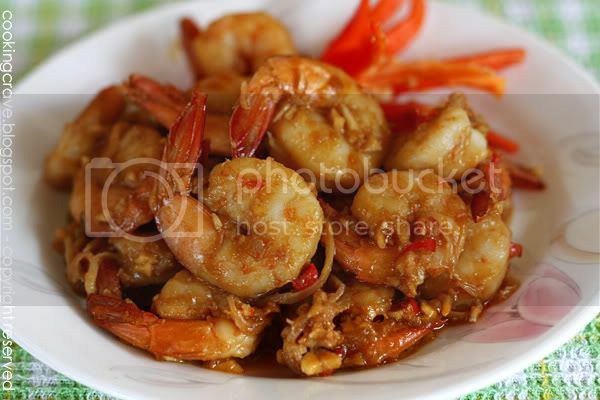 No salt are added because the fish sauce, soy sauce and oyster sauce used produce the salty taste to the dish already. On your previous comments, you say you need to improve on your food photography. Huh? I thought you're very good in that department, what else is there to improve? The 2 shots above are awesome, the lighting is soft and even, great exposure, your choice of focus point and bokeh makes it even better! Maybe it's because I'm still a rookie in photography and I couldn't recognize the so call "problem". I thought your food photography is fabulous! Thanks for making me hungry!